The Pittsburgh Steelers are known for nabbing great receivers in the mid to late rounds. 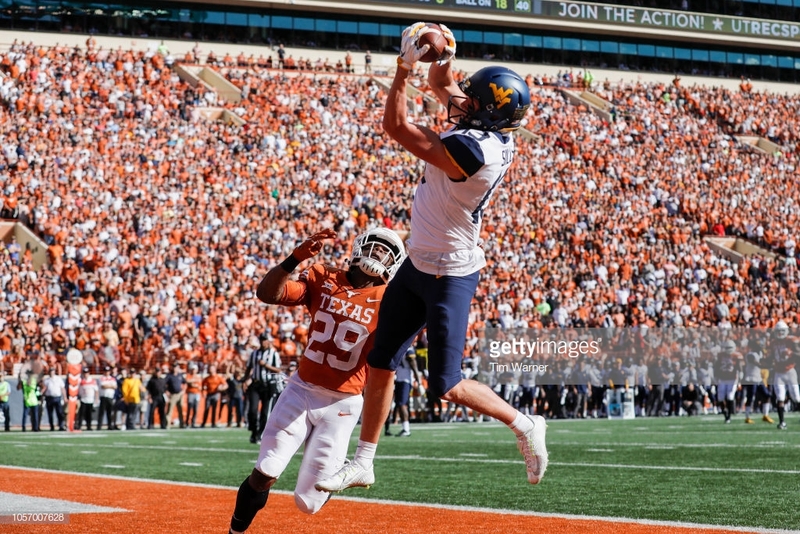 Is WVU WR David Sills the next hidden gem the Steelers uncover? The Pittsburgh Steelers are known for nabbing top flight receivers in the mid to late rounds. Mike Wallace, Antonio Brown and Emmannuel Sanders, for example. Is WVU WR David Sills the next hidden gem the Steelers uncover? While speaking on a Steelers podcast earlier this week, Tony Pauline of Draft Analyst claims the Steelers already have a candidate in mind when it comes to a wide receiver they will draft. While Tim Benz of Trib Live wasn’t quite willing to throw the word “love” out he did say that there is no doubt that the Mountaineer wide receiver is at least on Mike Tomlin’s radar. The story of Sills switching from quarterback to receiver after arriving at college is a very popular story. When you factor in how knew he is to the position, it makes it easy to project that he has plenty of room to grow as a receiver. Despite only barely over a couple years playing the position, when you look at his performance combined with his size, this will get him drafted and give him the chance to be an NFL receiver. While at West Virginia, Sills grabbed 35 touchdowns. His junior and seasons were nearly identical in yardage with 986 yards his senior season and 980 yards his junior season. Mountaineer fans know what kind of a red zone target Sills was for quarterback Will Grier during their two years together. From deep balls to fades, the two hooked up for many highlight reel plays. It would be very interesting to see David Sills get the opportunity to pair up with Ben Roethlisberger in a Steelers uniform. No matter where he ends up, there’s no doubt Sills will put in the work necessary to carve out a role and find success.